A French museum has amassed a collection of cars that used to belong to world leaders, including the DS Charles De Gaulle was blown up in. Motorbiker.Org's Mike Werner takes us on a tour. In the heart of one of France's wine areas, Burgundy, in between the rolling hills, rivers and forests, you'll find a beautifully restored 18th century castle. Next to the castle is a museum, called the Presidential Cars museum (Musée des Voitures des Chef d'Etat). The museum grew out of the passion of one man, Frenchman Olaf Delafon, a former stock trader working in the USA. His love for old cars grew into a passion, and he started collecting special cars; those used by the heads of state. The private collection turned into a public museum in 1993 after thousands of people asked to see the cars. He placed the presidential cars, all in different state of restoration, in the castle's barns. Today his collection contains cars from US Presidents JFK (1962 Cadillac Fleetwood Limousine) and Eisenhower (1953 Chrysler Crown Imperial), USSR Presidents Kroutchev and Brejnev (1960 Zil) and French Presidents like De Gaulle (1960 Renault Rambler) and Mitterand (1979 Citroen CX Prestige). He's even got a Popemobile and the car belong to the Romanian dictator, Nicolae Ceaucescu (a Mercedes 600 Pullman). Though all these cars are special, some are a bit more special. For example, the museum has the Citroen DS19 car that was blown up when they tried to assassinate the General De Gaulle. 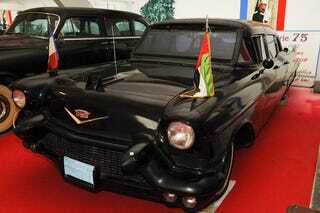 The heavily armored 1957 Cadillac Fleetwood Limousine belonging to the Emir of the Abu Dhabi, United Arab Emirates is also shown. The front window has been replaced by a window used on airplanes, and tall chrome has been painted black, giving the car a sinister and dangerous look. Some cars still have the original dust on them as they were found. One even has a sign on it saying "Original Dust". Like all museums, there's even a souvenir shop, but this one is special. Olaf has on sale toy cars dating back decades, a nice touch for a museum. The museum is open every day, and starting next year April, a new exhibit will open, called "Barn Finds". Here, Olaf will be showing cars "as they come in", in other words, you'll see the cars without restoration, full of dust, rust and bird droppings.